The 2012 Bioscience Company of the Year will be announced at the AZBio Awards on October 23, 2012 at the Phoenix Convention Center. Arizona – September 17, 2012 – The Arizona Bioindustry Association announced today that Flagship Biosciences of Flagstaff and Phoenix, Brain State Technologies of Scottsdale, AZ, and Cord Blood Registry of Tucson, AZ and San Bruno, CA have been selected by an independent panel of judges as finalists for the 2012 Bioscience Company of the Year. The award recognizes the for-profit bioscience company whose Arizona-based operations did the most to transform the world during the last 12 months. 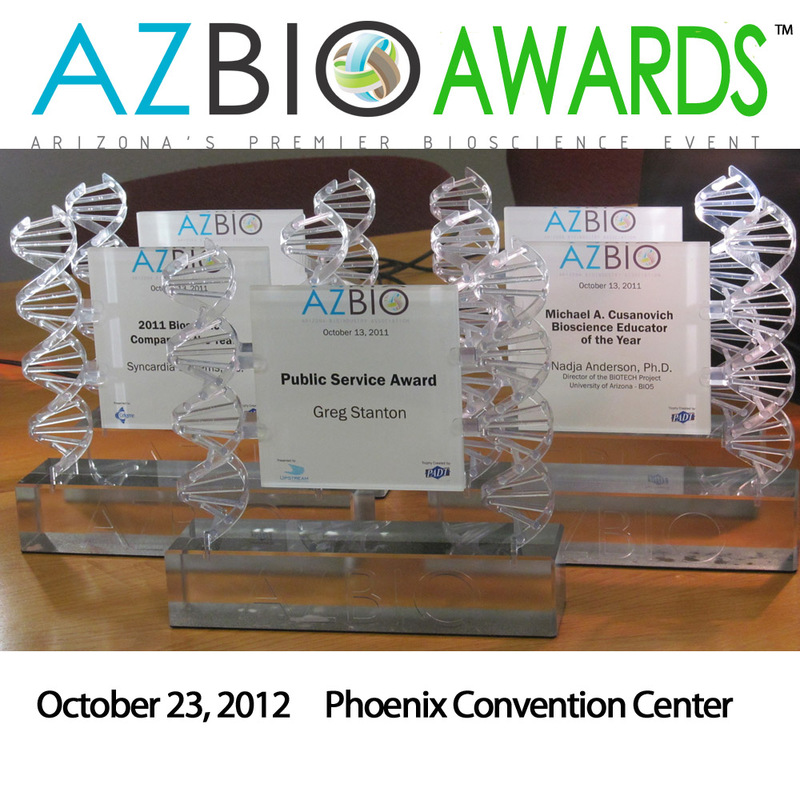 The winner will be announced at the AZBio Awards Gala on October 23, 2012. Flagship Biosciences provides quantitative tissue analysis services for pharmaceutical and medical device development. Flagship offers a broad range of tissue assessment options, achieved through a diverse set of approaches. Flagship Biosciences provides tissue analysis solutions to over sixty biotech, pharmaceutical, and medical device clients, with global programs in place for tissue-based companion diagnostics with three of the largest pharmaceutical companies in the world. Their sales grew 400% in 2011, and are on track to triple again in 2012. Flagship scientists published seven peer-reviewed articles in 2011, and filed 4 patent applications during the year. However, the largest development for Flagship was the acquisition of a histology and immunohistochemistry laboratory during the close 2011 which has added tissue procurement to complete their tissue-based analysis operations. Finally, the company’s image analysis technology won a best poster award at the Pathology Visions 2011 conference in San Diego, and a best presentation award at the Pathology Informatics 2011 meeting in Pittsburg. The company is currently working on a medical device spinout of their existing operations and expansion into Phoenix later this year. Committed to growing not only the company but also Arizona’s bioscience talent pool, the company currently utilizes many students from Northern Arizona University. 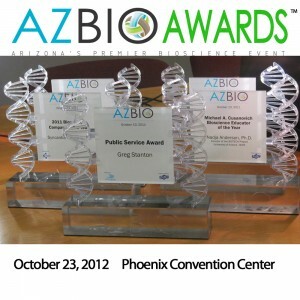 Flagship Biosciences was honored in 2011 with the 2011 AZBio Fast Lane Award. Brain State Technologies has a mission statement that is three words: To Help People. The corporate headquarters is based in Scottsdale, AZ and has nearly 200 providers in 18 countries that have helped over 50,000 people. Lee Gerdes is the Founder and CEO of Brain State Technologies® and the creator of the breakthrough neuro-technology Brainwave Optimization with Real-Time Balancing™, which helps people of all ages and conditions to overcome cognitive, emotional, and physical challenges and is transforming and likely saving lives all over the world. The firm and its process have been featured on ABC, FOX, CBS, OWN, People, The New York Times, USA Today, PARADE, The Arizona Republic, BrainWorld, Frontiers in Neuroscience, and more. Brain State offers a non-invasive process versus using drugs or surgery for a wide range of applications to overcome cognitive, emotional, and physical challenges including sleep disorders, alcoholism, meth addition, and PTSD. Their work has resulted in the largest relational database of brain patterns on planet Earth. Brain State’s patent-pending procedure compares over 48,000 brain frequencies and its patented Relational Sound (Wave Aid) program provides for ongoing process support. Committed to serving our veterans, the company offers pro bono services to soldiers with debilitating symptoms of PTSD. The company will host an Open House on October 11, 2012 and welcomes members of the community to drop in and learn more. Cord Blood Registry (CBR) Cord Blood Registry is the world’s largest and most experienced stem cell bank. For more than 15 years, they have led the industry in technical innovations. CBR stores cord blood and tissue for more than 400,000 children. Moreover, CBR was the first bank to offer families in the U.S. storage for stem cells contained in cord tissue, which may help repair the body in different ways. CBR has also helped more clients use their cord blood stem cells in treatments than any other family bank. CBR research and development efforts are focused on helping leading clinical researchers advance regenerative medicine that may help families in the future. CBR’s innovative research resulted in the creation of the CellAdvantage® collection system with heparin, which helps recover 99% of cells.1-3,8. CBR is also advancing medicine in the laboratory and in the research field by helping advance newborn stem cell medicine. CBR works with leading developers and they have designed and implemented new technology and processes for cord blood banking. Their cutting-edge laboratory in Tucson, Arizona, was designed and built exclusively for newborn stem cell processing and storage. Through partnerships with academic institutions, CBR supports research that could lead to new stem cell medicine in the future. CBR has cultivated relationships that allow the company to offer clients exclusive access to some of the latest clinical trials. Cord Blood Registry is making a difference in the lives of patients. Click here for a video library of patient stories. AZBio would like to thank the finalists as well as the teams at NACET, the University of Arizona, and KCA for their contribution in collecting the materials for both the company nominations and for researching and cataloging the many ways our finalists are contributing to our community. We also acknowledge and thank our independent panel of judges for their support in the evaluation of the wonderful candidates that were nominated this year. Posted in AZBio News, Events, Members, Press Room and tagged 2012 AZBio Awards, Brain State Technologies, CBR, Cord Blood Registry, Flagship Biosciences.